You know those crochet projects. The ones that only use a skein or two of soft and affordable yarn. The ones that only take a few hours to make but you end up with something stylish and versatile to wear. The ones that are perfect for a quick yet fabulous gift. This is one of those projects. I also love this yarn. I made the one above with Paton's Lace in the Sachet colorway. 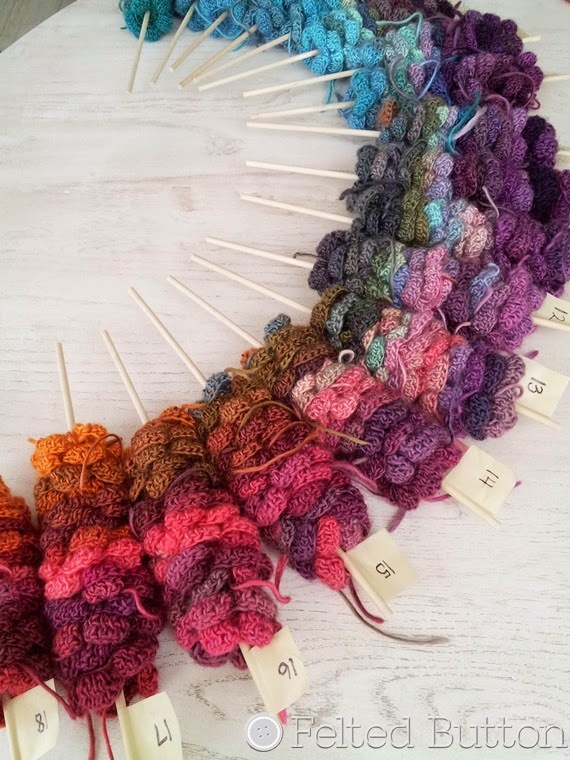 I simply love the long color runs which make for beautiful color changes without weaving ends. This yarn is Premier Cotton Fair--a fabulously soft cotton/acrylic blend that feels super snuggly around your neck. I've also been working on several other fabulous designs. Want a peek? This is called the Confections Blanket is just about ready for release. You can check my Ravelry shop for it soon. I'll explain the little skewers in an upcoming blog post--but let me just say that this design makes me giddy, as does this "skewered flower" system. If you haven't signed up for my newsletter for updates on patterns (which often contain discounts), you can do that at the top of the sidebar. That way, you'll be in the "Button" loop. And I promise I won't bombard your inbox! Another great way to stay in the Button loop is to hang out with me on Facebook. We talk yarn, share photos of our work and make announcements of new stuff going on in the crochet world. And if you just like looking at pretty pictures--come see me on Instagram. I'm FeltedButton there--well, everywhere, in fact. Thanks for stopping by! I am really grateful for your support of my work! Love your shawl, love your work! It all look so special with a great use of colors!